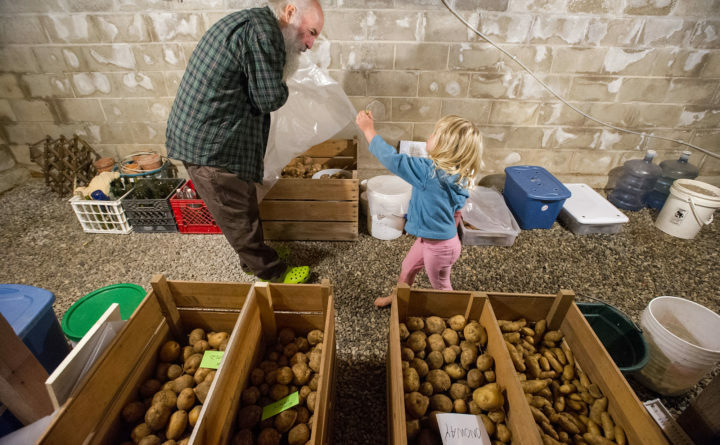 John Belding at Little Falls Farm in Harrison checks out vegetables stored in his farm's below-ground root cellar with his granddaughter. Long before the age of mechanical refrigeration, people needed a way to keep food safely stored over the non-growing months of winter. Among the oldest of those storage methods is the root cellar, an underground room that acts like a natural refrigerator maintaining temperatures in the mid-30 degrees Farenheit during the winter and mid-50s in the summer. Fast forward to the present, and despite the never ending wave of new food storage appliances on the market, there are many small farms and home gardeners who prefer to do things the old fashioned way. And whether it’s the harvest from a rural homestead or urban rooftop garden, there’s a root cellar-type storage system to match. What makes a good root cellar? Root cellar type storage can be as elaborate as a separate, subterranean structure or as simple as a collection of rubber totes filled with peat moss, according to Lilley. Lilley said he then has them identify places in their homes that are warm and dry, warm and moist, cool and dry and cool and moist — what he calls residential microclimates. “Those four different microclimates fit the storage requirements for most fruits and vegetables,” he said. Basements, he said, are a perfect example of those indoor microclimate variations. The University of Maine Cooperative Extension service has an online fact sheet and guide that gives the recommended temperature and humidity storage conditions for just about every fruit or vegetable that grows in the state. Storing vegetables like carrots covered with peat moss or sand in totes is one way to replicate root cellar conditions. Apples, for example, can live happily for up to a year stored in conditions where the temperatures range between 30- and 40 degrees with 90 to 95 percent humidity levels. Winter squash, on the other hand, do better when stored at 50 degrees with humidity ranging between 50 and 70 percent for up to six months. Produce like carrots, beets, parsnips or celery root need to hold onto moisture in storage so they are not shriveled and inedible after a few months. Lilley said an easy do-it-yourself root storage system for root crops needing moisture is in peat moss inside a plastic tote. 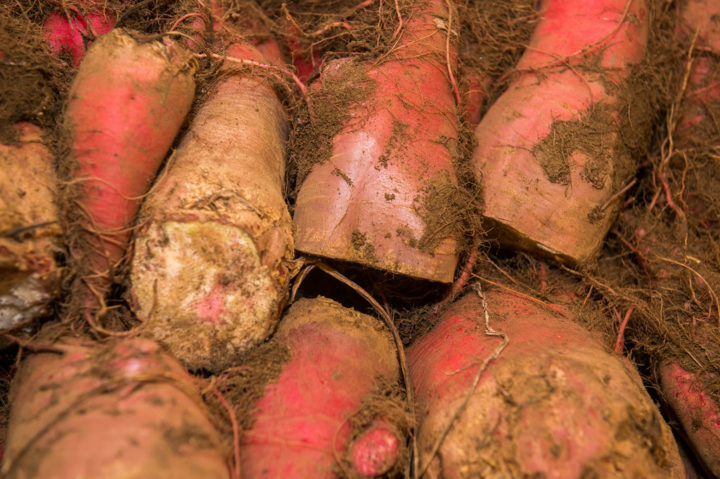 Those root crops can also be stored in sand, Lilley said, but added he prefers the peat moss as it is easier to clean off the vegetables than the sand. A step up from storing crops in totes is building an insulated closet or small room in a basement or unused corner of the house, Lilley said. “In that space you can keep things at different temperatures and humidity than the rest of the house or basement,” he said. Lilley said if possible, it’s a good idea when creating that space in a basement to incorporate an area that has a ground level window that can provide air circulation and help modulate temperatures and humidity. 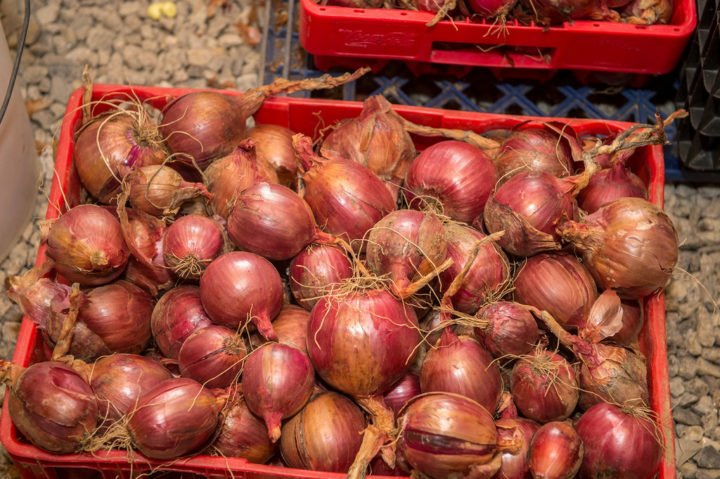 Storing vegetables like onions covered with peat moss or sand in plastic totes is one way to replicate root cellar conditions. That way there are microclimates within the microclimate of the insulated space. Once the space is dug and properly covered with an insulated roof and walls, Lilley said it’s a good idea to cover the floor with gravel to keep any ground moisture from creating a muddy mess. It’s a good idea to also install shelving in a dug root cellar to keep produce above any excess moisture that creeps in. Regardless whether the winter storage is as simple as plastic totes or elaborate as a dug and lined root cellar, Lilley said the space should be thoroughly cleaned out at the start of each growing season. Anybody, he said, can have successful winter produce storage.